This was on TV last night. Still pretty terrible, it did nothing to improve mainstream perception of the industry and its fans, unless, of course, those perceptions were based on previous years' shows, in which case this one was actually less abrasive and a hair classier than the last time I saw it, back when Samuel L. Jackson accepted the "Game of the Year" award for "Grand Theft Auto 2.". Highlights included a sober Kiefer Sutherland in attendance to graciously accept some nonsense award, living legend Will Wright making the most of his TV time to give a genuinely thoughtful and heartfelt speech, and all the winning developers receiving their wacky trophies with sincere gratitude. I used to marvel at how accurately Capcom managed to capture the likenesses of Takeshi Kaneshiro and Jean Reno in the Onimusha games, but this one really caught me by surprise. 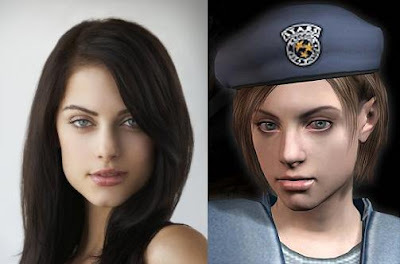 I wasn't even aware that Jill Valentine had a flesh-and-blood model, but those eyes, usually the hardest feature to get right, were simply unmistakable.